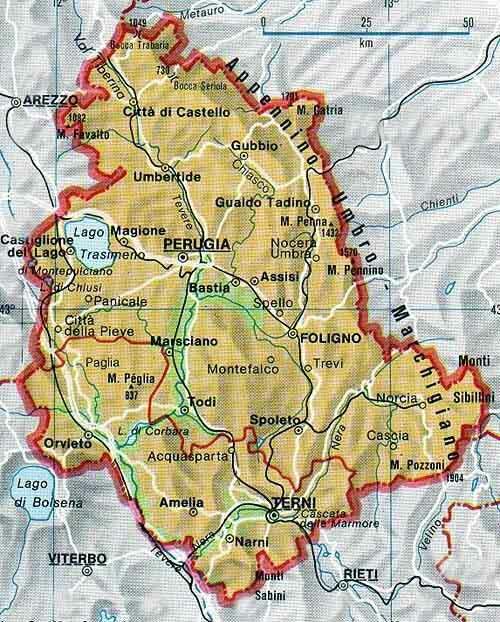 Territory: The region is mostly mountainous and hilly and presents a landscape rich in woods and water resources. It is crossed by the Apennines, which form numerous valleys. This region has a comparatively large lake: the Trasimeno. Art: In Umbria the traces of the Etruscan civilization are remarkable, as visitors can see in Todi, Bettona, Orvieto and Perugia. Spoleto has important Roman remains; Spello is a city, where the Romans left some impressive remains. 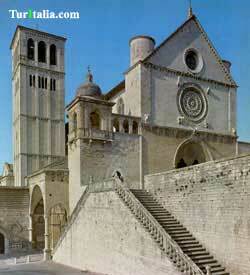 Other important Roman works can be found in Assisi and Gubbio. The Romanesque architecture thrived in this region at the beginning of the twelfth century: some beautiful examples are the Cathedrals of Spoleto and Assisi, St. Silvestro and St. Michele in Bevagna. The Gothic style reached very high levels, and imposing examples are present in almost every city. The Renaissance can be seen in magnificent monuments in Perugia, Gubbio, Todi, but it enjoyed a smaller development than other styles. Museums: In Perugia there is the National Gallery of Umbria, which is one of the most important exhibition of the Gothic painting, with masterpieces by Duccio di Boninsegna, Beato Angelico, Piero della Francesca. The National Archaeologic Museum of Umbria houses a splendid and very rich Etruscan collection. Assisi, birthplace of St. Francis, one of the greatest figures of Christianity, has the superb Basilica of San Francesco with the world famous Giotto�s frescoes, showing in 28 splendid paintings the life of the Saint; the Pinacoteca Civica and the Cathedral�s Museum. Spoleto has the Gallery of Contemporary Art. In Gubbio there is the Civic Museum, which holds the famous �Eugubine tables�: seven bronze plates, from the second century B.C. Foligno can offer the tourists the Archaeologic Museum and the Pinacoteca Civica. To be visited: Rich in history and in nature, Umbria offers the Falls of the Marmore, which are the highest in Italy; the sources of the Clitunno and Mount Subasio. The Basilica of Santa Maria degli Angeli and the Rocca Maggiore. The ancient city of Spoleto offers the Roman Theater and Druso�s Arch. Near Perugia, people can visit the Ipogeo del Volumni, which is an Etruscan tomb. Devised routes and text collections of webs of the Official Organism of Italian Tourism.